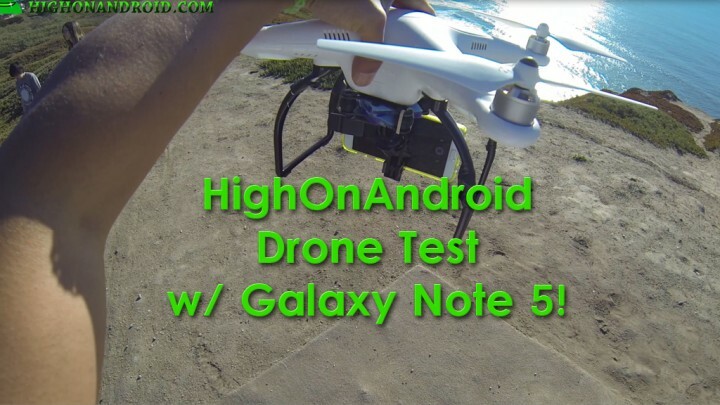 HighOnAndroid Drone Test w/ Galaxy Note 5 in 4K! I’ve always wanted to push the limits of smartphone cameras and how we test them. In this episode, we take a Phantom 2 drone quadcopter and the Galaxy Note 5 to test out the OIS (Optical Image Stabilization) of the Note 5’s 4K camera. We’ve intentionally did not use a gimbal since that wouldn’t test the stability of the Note 5’s OIS capabilities (that would be cheating). No stabilization was used in this video other than Note 5’s OIS. The Galaxy Note 5 held up very well. In auto focus mode, it had some trouble focusing but otherwise it did very well. Also, there was a bit of wind around 10-15MPH (especially the scenes where drone is hovering over ocean as there’s more wind there due to the waves) and we were still able to get some decent shots. I should have a drone test for every new smartphone so you can compare the results. Overall, Note 5 is definitely one of the best for stabilization and 4K.